A folk music character drama with comic shadings, Inside Llewyn Davis explores the Greenwich Village music scene of the early 1960s through the story of one struggling musician having a really bad week. It's New York City in 1961. Llewyn Davis (Oscar Isaac) is a marginal folk singer who occasionally performs at the Gaslight club. Llewyn is penniless, homeless, sleeps on friends' couches, and has still not recovered from the trauma of his performing partner's suicide. 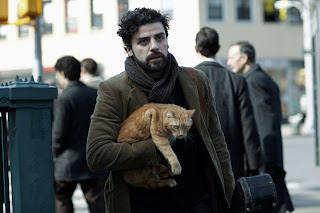 Llewyn accidentally lets loose the house cat of his friends the Gorfeins, then learns that his recently released solo album is selling poorly or not at all. 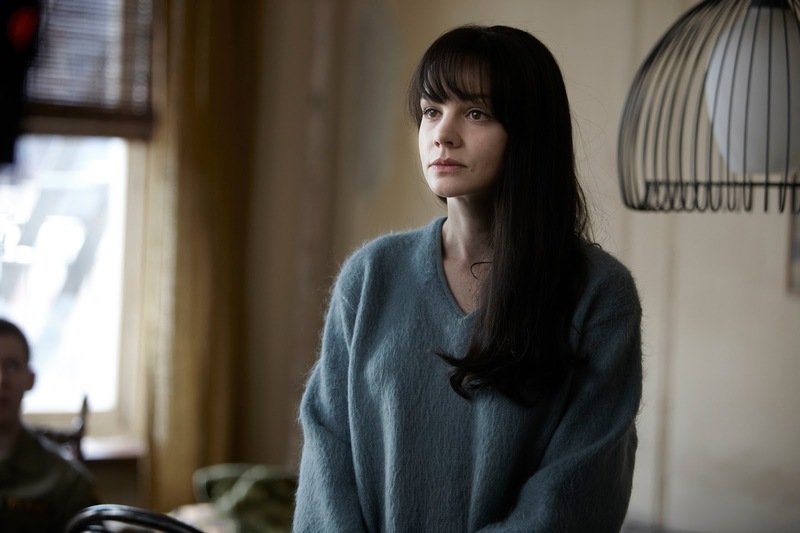 His week gets much worse when he finds out that his married friend Jean (Carey Mulligan) is pregnant, and the child may or may not be his. 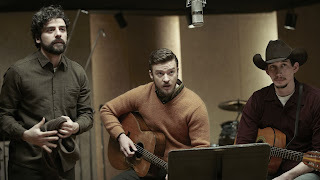 Llewyn gets no help from his agent, but does get a break from Jean's husband Jim (Justin Timberlake), who connects him with singer Al Cody (Adam Driver), and the trio record a novelty space-themed folk song. Desperate for cash upfront, Llewyn forgoes any future royalties. He decides to travel to Chicago to personally meet legendary producer Bud Grossman (F. Murray Abraham). On the way he shares a surreal car trip with overbearing jazz musician Roland Turner (John Goodman) and lyricist/driver Johnny Five (Garrett Hedlund). The meeting with Grossman does not go as planned, and Llewyn starts to question his dedication to a career in music. Directed by the Coen brothers Joel and Ethan, who also co-wrote the script with Scott Rudin, Inside Llewyn Davis works best as a dark comedy that probes at the heart of dreams of music success. The mood is bleak, the prospects poor, and its quickly apparent that everyone other than Llewyn Davis is already aware that he has a bright future behind him. Still he persists, ignoring with increasing difficulty the signs that it may be time to pack it in. Despite the preponderance of humour, the film sets an overall sad mood reflective of artists struggling to make ends meet. Washed-out colours dominate, both mimicking and mocking Llewyn's life of couch surfing in nondescript apartments while scratching out a living by borrowing money and bumming cigarettes from any available source. The film also resonates with the messiness of real life by keeping several threads loose. The novelty song royalties are a tantalizing decision point, a side-story of a former girlfriend, now in Akron, is left dangling on an exit ramp, and Jean's pregnancy presents another imperfect puzzle to grapple with. While the film runs an efficient 105 minutes, the plot is quite slight and the Coens at times do struggle to find something else to go wrong for their unfortunate protagonist. The return trip from Chicago includes an unnecessary midnight shock on an isolated snowy stretch of road, there is an obvious side-trip to visit an invalid father, and the film is littered with a few too many complete renditions of folk songs that eat up minutes and slow the film right down. Much better is the segment with John Goodman as the boorish fellow traveller to Chicago Roland Turner, a bellicose know-it-all who can't stop talking, and is both exceedingly annoying and extremely funny. In keeping with the film's disposition, both Turner and his side-kick Johnny Five are unceremoniously ejected from Llewyn's journey. When everything that can possibly go wrong does so and them some, including that troublesome cat repeatedly escaping and at the most inconvenient times possible, it may be time to take stock. But a week will pass before Llewyn Davis sees the writing on the back alley walls of Greenwich Village.